The Boxing Truth®: What’s Next For Jacobs, Peterson, And Garcia? What’s Next For Jacobs, Peterson, And Garcia? On August 9th the Barclays Center in Brooklyn, New York played host to a Boxing card, which was headlined by a tripleheader that may produce some interesting storylines in the future. Although some might feel the card headlined by Jr. Welterweight world champions Danny Garcia and Lamont Peterson competing in separate bouts, and top Middleweight contender Daniel Jacobs, fighting for interim/regular champion status in the WBA’s Middleweight ratings did not provide much in the way of competition for the aforementioned headliners, it did serve as a showcase of what might lead to some interesting fights for all three. The Middleweight fight on this card pitted WBA number four rated contender Daniel Jacobs facing the number two contender Jarrod Fletcher in a bout to determine interim/regular champion status in the WBA ratings. Jacobs was very impressive in this fight as he controlled the tempo of the fight from the outset and scored knockdowns in rounds one and five to earn a stoppage in the fifth round. Jacobs now finds himself as one of three fighters who hold some form of champion status as recognized by the World Boxing Association (WBA) in the Middleweight division. The current unified WBA/IBO world champion is Gennady Golovkin, while Jacobs and WBA number one contender Dmitry Chudinov each hold interim/regular status. Ironically both Jacobs and Chudinov fought for their status on the same day as Chudinov scored a third round knockout of the WBA number twelve rated contender Medhi Bouadla in Crimea, Russia. Readers may recall following Gennady Golovkin’s recent title defense over Daniel Geale when I briefly discussed these two fights for interim/regular status as to whether or not the two fights would lead to the two winners facing off to determine a mandatory challenger for Golovkin. It still remains to be seen. Jacobs however, did state after his win over Fletcher that he would like to face current WBO champion Peter Quillin in what would be a very interesting fight and an encounter that would generate significant interest in New York where both fighters are based. The political landscape of the sport and designations of interim/regular champion status by the WBA notwithstanding, Daniel Jacobs is very much a player in a talent stacked Middleweight division and poses an interesting challenge for anyone in the division whether they be a world champion or a top contender. 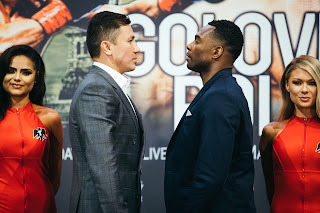 With the deep depth that the Middleweight division has to offer, there are certainly several options on the table for Jacobs going forward if a fight with Gennady Golovkin or Dmitry Chudinov is not in his immediate future. The other potential fight that might be made in the future coming out of last weekend’s card could be a unification bout between Jr. Welterweight world champions Danny Garcia and Lamont Peterson. Peterson successfully defended his IBF world title on this card with a tenth round stoppage of number thirteen rated IBF contender Edgar Santana. Peterson’s solid attack to the body and head and higher offensive output were simply too much for the challenger who could not find a way to nullify Peterson’s consistent pressure and offense. Despite the “Game” effort of Santana, the fight was justly stopped by Ringside physician Dr. Bobby Jordan shortly before the conclusion of round ten. With the win Peterson has now won five out of his last six fights with a defeat coming at the hands of top contender Lucas Matthysse, who stopped Peterson in three rounds in a non-title bout last year. Peterson however, has rebounded from that defeat with two successful title defenses and has now successfully defended his title three times overall. Peterson’s counterpart the unified WBC/WBA Jr. Welterweight world champion Danny Garcia closed the show on this card in devastating fashion scoring three knockdowns of contender Rod Salka in round two to score the knockout in a non-title bout. Much as is the case with Daniel Jacobs, there are several options that could be on the table for both Peterson and Garcia coming out of this card. The 140lb. Jr. Welterweight division much like the 160lb. Middleweight division is a weight class that has plenty of depth with several names including three-division world champion Adrien Broner, Hank Lundy, Lucas Matthysse, Humberto Soto, Mauricio Herrera, and Ruslan Provodnikov just to name a few. In the opinion of this observer however, a fight to further unify the Jr. Welterweight division between Garcia and Peterson makes sense, with the recently newly crowned WBO champion Chris Algieri moving up in weight to challenge Manny Pacquiao for the WBO Welterweight world championship in November. Although Jacobs, Peterson, and Garcia were dominant in their respective bouts last weekend and, despite the opinion of some that perhaps the fights were mismatches, fight cards that serve as a showcase for world champions and rising stars can set up potential lucrative fights down the road, assuming of course that the headliners are successful in winning their bouts. There is after all a reason why fights take place. Even though there was nothing that emerged out of this card that would prevent any of the three from potentially securing big money fights down the road, even when fights are meant to be a “Showcase” or a “Tune-Up” there is always the potential for an upset.